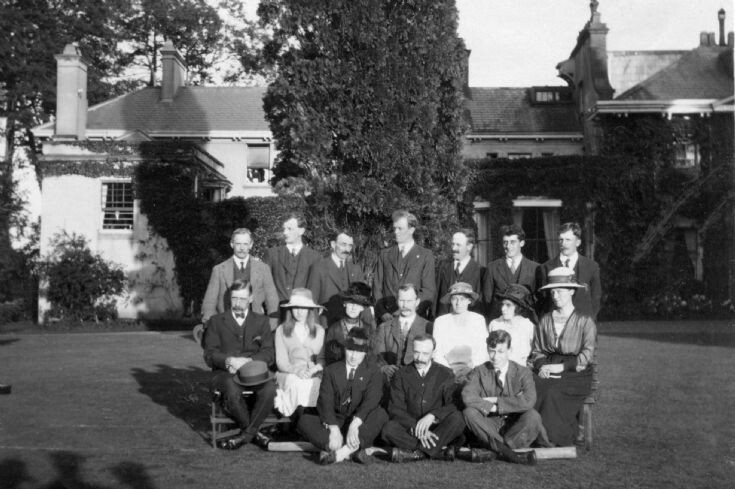 This photograph of members of the Handcross Orchestra was taken on 18th September, 1922 on the lawns of Tilgate Forest Lodge, Pease Pottage. No names are supplied but by comparing with other photographs of the Nix family who lived in the house, I would suggest that at lower right is the eldest son, Christopher Nix. I thought I would be able to recognise the father by his distinctive moustache only to find that seven of the men have the same! My ultimate conclusion is that Charles Nix is seated in the middle of the ladies. Lastly, I feel quite certain that the tall gentleman in the middle of the back row is a young Bill Robinson, hardware retailer in Handcross High Street. The gentleman back row far right is my grandfather, William Doggett, who was a member of the Handcross Orchestra and band for many years. He lived on the Hyde Estate where he worked as head gardener for the Warren family. Having compared this photograph with others I am now confident that the man second from the left in the back row is Bert Robinson, Bill's brother, who ran the watchmaker and jewellery shop next door.